Below you will find a sampling of what has been written about Tracey's four cookbooks. The Vermont Non-GMO Cookbook is a 2018 Readable Feast Cookbook Awards Finalist. "...They are exactly what the book’s subtitle says: recipes from hardworking food-raising and cooking professionals. "...Ease into cold-weather cooking with smoky lamb Bolognese or grilled beef tenderloin accompanied by rutabaga puree, braised cabbage and horseradish cream. Multicolored beet hash with potatoes serves as a brilliant-and healthy-centerpiece of Sunday brunch while Brussels sprouts with creamy sriracha dipping sauce will convert even purported sprouts naysayers. The late-winter cottage pie encourages riffing with whatever ground meat and veggies linger in your winter root cellar. "...I made the vibrant Carrot and Spinach Slaw, a recipe from Mighty Food Farm in Shaftsbury. This farm is just a stone’s throw from my hometown of Bennington, and grows organic fruits and veggies, including heirloom varieties not available in stores. The body of this salad is carrot, spinach, and shallot: crunchy and fresh. Baked Frittata with Baby Spinach, Roasted Red Peppers, and Quark Cheese; Grilled Beef Tenderloin with Rutabaga Puree, Braised Cabbage, and Horseradish Cream; and Old-Fashioned Organic Cream Cheese Cheesecake. In addition to palate pleasing and appetite satisfying recipes, "The Vermont Non-GMO Cookbook" includes informative profiles of a hand-selected group of pioneering organic Vermont farmers, chefs, and non-GMO artisans. A pleasure to browse through and ideal for planning menus with, "The Vermont Non-GMO Cookbook" is an ideal and highly recommended addition to personal, family, and community library Regional Cookbook collections. It should be noted that "The Vermont Non-GMO Cookbook" is also available in a digital book format (Kindle, $16.19). "...The profiles and directory are there to give anyone a great jumping-off point for a culinary trip through Vermont. Even if you’re just an armchair traveler, you can sit back and thumb through the great photos and read about all the producers Vermont is lucky to have. Read more of this article at: http://wp.me/p2SJwY-1wl. Read more of this article at: http://unwrittenrecipes.com/blog/2018/the-vermont-non-gmo-cookbooks-late-winter-cottage-pie-famous-fridays. "...Tracey Medeiros is the author of The Vermont Non-GMO Cookbook, a beautifully written and photographed book..."
"What I really love most about this stuffing — and what I think makes it stand out — is the roasted root vegetable mixture. Rutabaga, beet, carrot, onion, garlic, fresh rosemary, and fresh sage are roasted with a little olive oil and honey before going into a buttered baking dish with the rest of the stuffing ingredients. You've got everything you could possibly want in one dish here — crisp artisan bread cubes; slightly sweet roasted root vegetables; crumbled, browned sausage; creamy goat cheese; and some fresh parsley and lemon zest to really brighten things up." "Tracey Medeiros, the author of The Connecticut Farm Table Cookbook, was kind enough to ask the Accidental Locavore to take a look at her new book. Like the previous one, The Vermont Farm Table Cookbook, it tells the story of local farmers and food purveyors along with 150 of their signature dishes. "Not only do you get a broad cross-section of foods, the recipes vary greatly, from simple, easy-to-toss-together dishes, to ones requiring both time and some kitchen skills. I’ve bookmarked a few, like the raclette potatoes (my kind of dish!) to come back to when the weather is colder and ones like the pork belly stuffed tomatoes, that need to wait a month or two for peak produce." "What delights me most about The Connecticut Farm Table Cookbook is its splendid localness. I know and have visited a lot of the farms and restaurants featured in the book. What’s that? You don’t live in Connecticut? So you think this book holds nothing for you? Nonsense. Authors Tracey Medeiros and Christy Colasurdo have compiled 150 recipes from the state’s best and most beloved destinations. (These include our go-to farms, Maple Bank Farm and Averill Farm, and, of course, the restaurant Community Table, which we’ve been to more times than we can count.) Flip through the book and you’ll be wooed by fresh corn soup, knocked out by fennel-Parmesan fritters with a buttermilk-bacon dressing, and inspired to move to New England by Nutmegger’s lamb chops with a sauce of garlic, nutmeg, and sumac. And when you do decide to be my neighbor, I’ll bring over a basket of fresh Blackberry River scones." "Some of you might remember me sharing a similar cookbook a couple years ago, The Vermont Farm Table Cookbook. 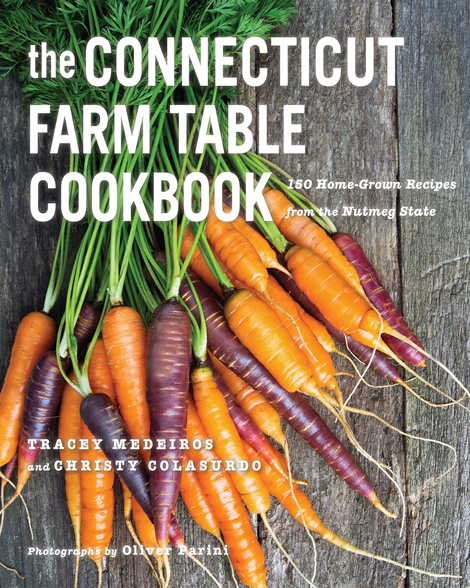 The author, Tracey Medeiros, partnered with chefs, families, farmers and more to put together The Connecticut Farm Table Cookbook. It’s packed with 150 recipes from the area’s top chefs and local farmers. “It’s a window into the world of Connecticut’s farm-to-table movement, brought to life through vivid farmer and chef profiles, local lore, and stunning photographs. "I love that this book is dedicated to Connecticut farmers, fishermen, cheese makers, bee keepers, foragers and food producers. These are the people who take great pains and pride in bringing the people of Connecticut fresh, wholesome and local foods. Each page introduces you to a farm, their life, what they do, how they got started and then shares a delicious recipe." "The book offers a beautiful layout of amazing recipes from all over Connecticut. Also available is The Connecticut Farm Table Cookbook YouTube Channel where Tracey brings the recipes to life in a friendly and educational way. But you don’t have to live in Connecticut in order to savor some of the amazing recipes featured in the book." "Perfectly Written Recipes: The Vermont Farm Table Cookbook." Web log post. Knowwhereyourfoodcomesfrom.com, 6 Jan. 2016. Web. "Beyond being delicious in concept, the recipes are perfectly written. The consistency across recipes from the numerous different kitchens is a credit to Ms. Medeiros’ recipe testers. I followed each recipe I made exactingly, and the dishes came out perfectly, a rare thing, particularly when multiple recipe authors are involved. Cooks using this book can cook confidently without the need to modify or interpret the recipes." 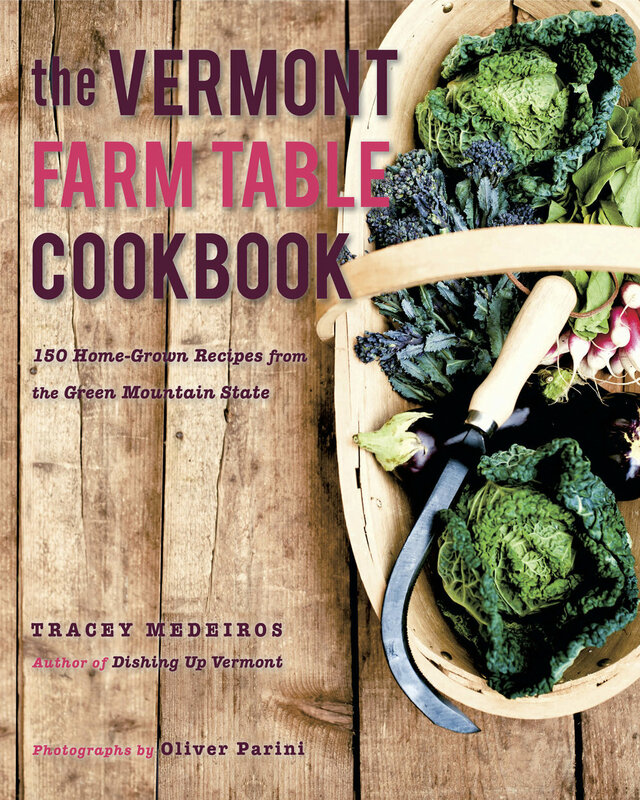 "In The Vermont Farm Table Cookbook: 150 Home-Grown Recipes from the Green Mountain State, freelance food writer, food stylist, and recipe developer Tracey Medeiros has compiled delicious, nutritious, and “kitchen cook friendly” recipes that celebrate the culinary contributions of Vermont to the rest of America. The recipes range from Cumin-Roasted Tri-Colored Carrots with Chevre; Pasta with Veal and Pancetta Bolognese; and Tomato Coconut Soup; Beer-Battered Fiddleheads; Amber ale-Braised Highland Beef Chuck Roast; and Maple Pecan Pie. Profusely illustrated throughout and featuring succinct commentaries on the farms, creameries, farmers’ markets, and food companies of Vermont, The Vermont Farm Table Cookbook: 150 Home-Grown Recipes from the Green Mountain State is as much fun to browse through as it is to create menus with for any dining occasion from daily family meals to special celebratory occasions. Highly recommended for personal, family, and community library cookbook collections, it should also be noted that The Vermont Farm Table Cookbook: 150 Home-Grown Recipes from the Green Mountain State is available in a Kindle edition as well." Dishing Up Vermont was honored by The National “Best Books” 2009 Awards (USA Book News) as a “Finalist” in the “Cookbooks: Regional” category. The book was also a 2010 National Indie Excellence Awards’ “Finalist” in the cookbook category. By Christine Bulson, SUNY at Oneonta Lib. ..."A beautiful, inexpensive cookbook; recommended for libraries building a regional collection." ..."The most cutting-edge book of the recent New England crop is Dishing Up Vermont (Storey Publishing, 2008, $19.95) by food writer Tracey Medeiros, which showcases the products and recipes of farms, orchards, restaurants and inns in that increasingly food-centric state. The Vermont Fresh Network, which benefits from a portion of the book's proceeds, was the nation's first statewide farm-to-restaurant program. As in the trend among local-food cookbooks, Dishing Up Vermont offers lots of beautiful photographs, not of the recipes, but of their raw ingredients in natural settings -- stalks of corn, berries on the vine and yes, unsuspecting lambs who may eventually become dinner. Those raw ingredients are used in inventive ways. Sometime this fall, you simply must put aside your normal brunch dish for the book's exquisitely decadent Vermont Croque Monsieur. This version of the traditional French bistro sandwich, contributed by a chef from Cliff House at Stowe Mountain Resort, features cinnamon-raisin bread cooked in egg and slathered with a spread of mascarpone cheese blended with chives and a bit of maple syrup, then piled high with ham, turkey and Gouda and baked. The book's flourishes are fun, but some of the best food in Dishing Up Vermont is simple. With just eight basic ingredients, the Flip-Over Apple Cake is a good example. Its slightly crunchy yet buttery underbelly serves as a fine foil for its tender, pretty apple topping. Though the book's recipe, contributed by owners of a 114-year-old Vermont orchard, calls for Northern Spy or Rhode Island Greening apples, I found that a combination of Ginger Gold and tasted just fine." ..."Dishing Up Vermont brings to life that food community across the state through appetizing dishes like mini frittatas with zucchini, goat cheese, and tomatoes from Does' Leap Farm in East Fairfield, grilled quail salad with maple vinaigrette from The Inn at Weathersfield in Perkinsville, and gingerbread cupcakes with orange-cream cheese frosting from Izabella's Eatery in Bennington. As Medeiros says, "It puts a face on the farmers and chefs in Vermont who grow, market, prepare, and cook the state's freshest foods." Not only is it great food, she adds, "but we care about how we grow it." ..."Dishing Up Vermont: 145 Authentic Recipes from the Green Mountain State is a compilation that unquestionably lives up to its title. Food writer and Tracey Medeiros, whose recipes have formerly appeared in "Bon Appetit", "Cooking Light", "Eating Well", and "Hampton Roads", offers easy-to-follow instructions for preparing tasty delights such as "Vermont-Style Hush Puppies", "Grilled Marinated Venison Loin", "Grilled Maple-marinated Portobello Mushrooms", "Butternut Squash Ravioli with Apples and Pears", and much more. Full-color photography and an assortment of Vermont food and eatery anecdotes round out this wonderful culinary tour de force." ..."This is a really lovely cookbook to look at. It is full of beautiful colour photos of the Vermont landscape and historical buildings, as well as all types of produce and finished recipes. Medeiros tells stories about producers and restauranteurs and provides background to a number of the recipes. Respect for the people who bring the food to your table is apparent on every page. Of course, the proof of a cook book is in the cooking, and I'm very happy to say that this book is a success in that as well. I've tried a number of recipes, all of which I would happily make again. They are clearly written and easy to follow, with the ingredients in bold face to the left and the instructions to the right. Every time I open this cookbook, I see another recipe that appeals to me. This would make a wonderful Christmas gift for the cook on your list. So often we are enticed into buying flashy celebrity books where one or two recipes work, but most are too complicated or just don't really work and it ends up at the back of the bookshelf collecting dust. I don't think you will have that problem with this book."